If you want to watch HD movies on Kodi, it can be hard to find accurate information about where to find them. Many Kodi addons mentioned on the web offer links to low-quality streams and do not properly label the ones that are high-def. So where can a Kodi user go to find high definition videos? 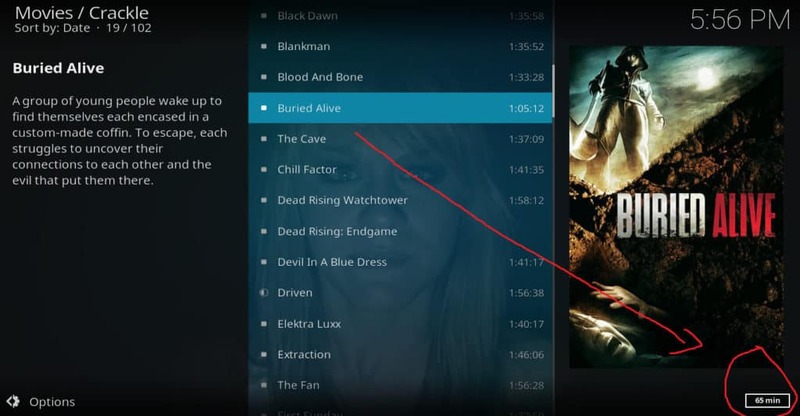 This article will provide a list of recommended HD movie addons for Kodi. It will also list a few addons mentioned on other sites that we think should be avoided. Kodi is a free media player that can be downloaded here. It allows users to play a wide variety of file formats, including MPEG4 and AVI. Kodi can run apps called “addons” that allow users to stream video from the Internet. It can be installed on TV devices such as the Nvidia Shield and Apple TV, or on a PC or smartphone. Some media outlets have identified Kodi as a pirated streaming tool. While it can be used for this purpose, there are also Kodi addons that stream from licensed sources, and all of the ones we recommend in this article fit into that category. While people who use Kodi to view unlicensed streams generally use a VPN to hide their activities, even users of legitimate streaming sites should employ a VPN. There are many privacy and security threats that users of all streaming sites face. A VPN can help lessen or even eliminate these problems. If a streaming video site knows where a user is located, it may restrict the content available based on geography. This problem can often be avoided using a VPN because it hides the user’s location. VPNs can also help to stop buffering caused by ISP speed throttling and man-in-the-middle attacks by hackers. Not all VPNs are created equal though. Some keep logs of users’ browsing habits, creating data that could potentially be stolen by hackers. Others are too slow to handle high-definition streaming video, leading to buffering problems all over again. Still others are hard to install, lacking apps for TV devices like the Amazon Fire Stick and Nvidia Shield. This is why we recommend IPVanish for all Kodi users. In our testing, we found that it handled 1080p video with no buffering. In addition to being fast, it has a strict “no logs” policy and apps for both Nvidia Shield and Fire Stick. The following Kodi addons are recommended to stream HD movies. These addons only stream from official, licensed sources. For this reason, they tend to have the highest quality video with few security or privacy concerns compared to those that stream from unofficial sources. PlayOn is a DVR service for streaming-video enthusiasts. It allows you to record movies from Netflix, Hulu, Amazon Prime Video, and many other services. In addition to letting you watch these recordings, the PlayOn Kodi addon lets you watch any other content available from these services. PlayOn is especially useful to Kodi users because many of the services it works with do not have functioning Kodi addons. In order to use PlayOn, you will need a $29.99/year subscription to PlayOn. You will also need a subscription to one of the services it works with. Netflix, Hulu, and Amazon Prime all contain an extensive library of HD movies, so PlayOn is an effective way to play these movies through Kodi. Crackle is a free movie & TV site that is monetized through advertising. Most of the movies on it are either 1080p or 720p. So there are plenty of high-def movies. Its library includes popular films like 300, Sherlock Holmes: A Game of Shadows, and The Hobbit: An Unexpected Journey, amongst many others. 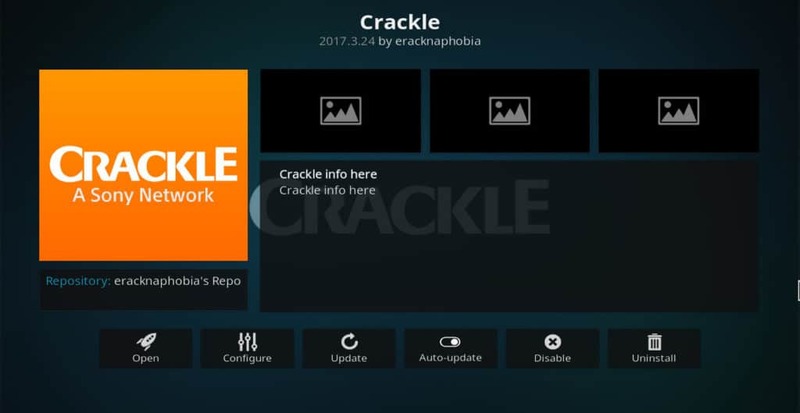 Here’s how to install and use the Crackle addon for Kodi. Tubi TV is another TV and movie site paid for with advertising. It carries over 7,439 titles, including thousands of feature films. Tubi TV has no 1080p films, but there are quite a few that are 720p, including Afternoon Delight, Agent Cody Banks, and Wedding Daze. Even the films that are not technically high-def are usually close to it, with 1024 X 576 being the most common format on the site. 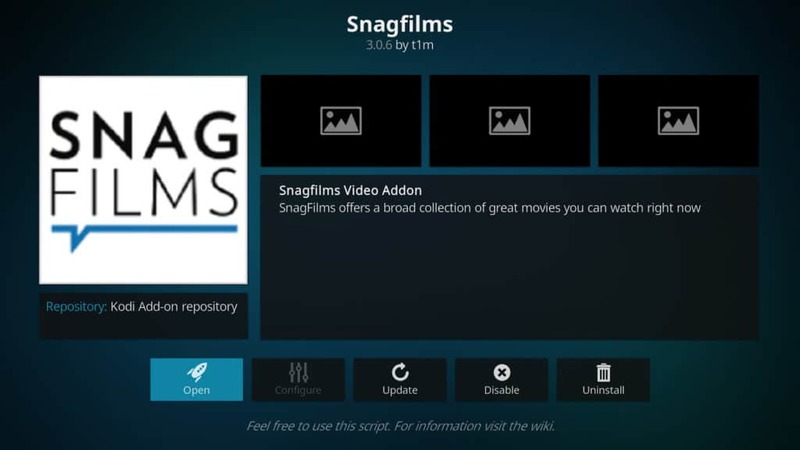 SnagFilms is a free movie site that contains a library of over 5,000 independent films. Nearly everything on the site is in 720p, including award-winning movies like Nanking and Out in the Silence. Not all of the movies these addons offer are available in HD. Here are two methods to determine whether the particular movie you want to watch is. Method #1: Look at the menu info after briefly playing the movie. From the addon’s list of movies, move your cursor onto the one you are considering watching. Some info about it will be displayed on the right side of the screen, including the length of the movie. However, the resolution may not be displayed just yet. Click the movie to begin streaming, then hit stop as soon as it finishes buffering and begins to play. This will send you back to the movie list. However, moving your cursor over the movie will now display its resolution. If the movie is HD, it will say either “1080 HD” for 1080p or “720 HD” for 720p. If the movie is not HD, it will say something else. From a PC Kodi menu, click the movie to begin playing, then hit the “o” key on your keyboard. Hitting this key will display six lines of info, the third of which will say something like “Video stream: 1,920 x 1,088 px, 1.78 AR, 23.976 FPS” The two numbers before “px” are the ones that are important. If the first of these numbers is 1920 or 1280, it’s an HD movie. The second of these numbers should also be close to 720 or 1080. However, movies vary as to what aspect ratio they were shot in, so it won’t necessarily be exactly one of these numbers. Keep in mind that Kodi will also down-convert video that is a higher resolution than your TV or monitor is setup to receive. So even if the movie is in HD, you may have to change your television or monitor settings to make sure you receive a true HD picture. 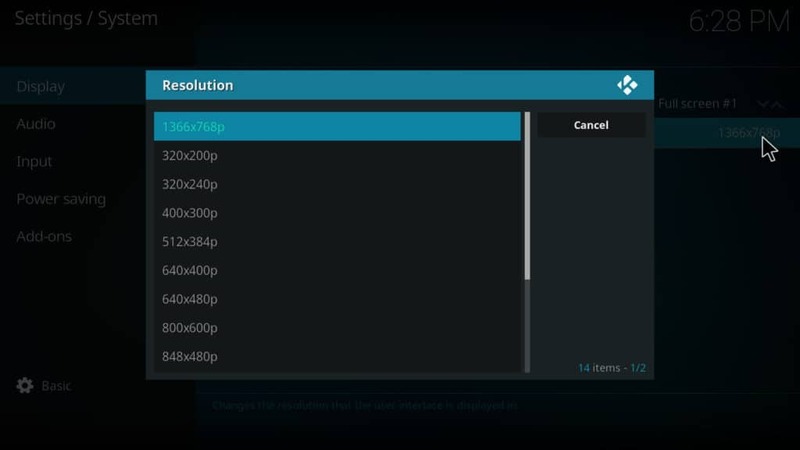 How to manually change Kodi’s resolution to HD. In most cases, Kodi will automatically sync video output with your display resolution. As long as your TV is setup to receive HD video, you generally do not need to change the resolution from within Kodi. However, it’s always possible that the automatic sync will not work. 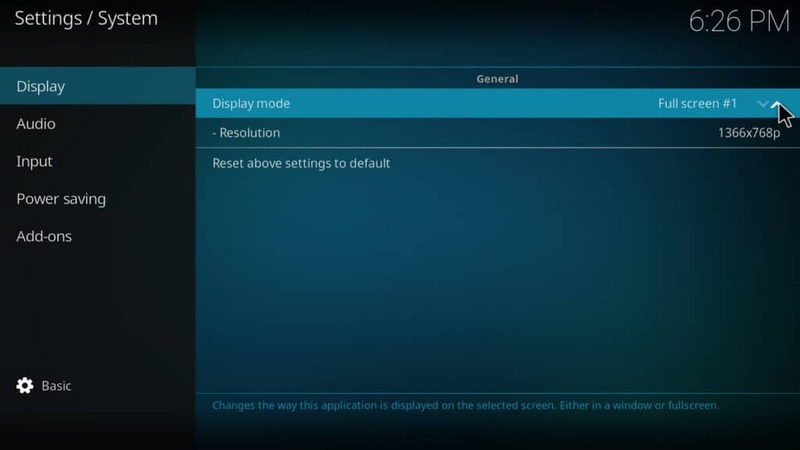 So here are instructions to manually change the resolution if you need to. From the list of resolutions, pick one that matches closest to the movie you are going to watch. For example, 1920 X 1080 for 1080p or 1280 X 720 for 720p. Depending on your device and TV, you may not be able to get an exact match. But the closer you can get, the more free of image artifacts the video will tend to be. The following Kodi addons are often mentioned on other sites as great for finding HD movies. However, all of these addons are known to stream unlicensed content. As a result, the repos that house them have all been shut down through lawsuits and other legal means. Not all third-party addons and developers should be avoided. Many provide a valuable service to the Kodi community in the way of relevant, legal, and fully-trustworthy addons. However, some third-party addons have been known to cause damage to users’ systems and lead to dangerous security breaches. We at Comparitech do not recommend installing any of these addons. When it was available from the Goodfellas repo, the Goodfellas Kodi addon provided both on-demand and live content from over 20 different categories, including many feature films. The HD movies on it were clearly labeled “HD.” However, the official repository for Goodfellas was shut down as a result of recent legal actions by the Motion Picture Association and other Hollywood legal groups. There are currently no known trustworthy sites that house it, and we do not recommend installing the Goodfellas addon. Movies4k.to was a popular Kodi addon that offered pirated movie streams prior to the Summer of 2017. It provided a five-point quality rating system for its links. By only watching streams that had a quality of “5,” a user could quickly find a movie that was in high-definition. However, Movies4k.to was a part of the old TVAddons.ag repository. This repo was shut down through legal action in the summer of 2017. 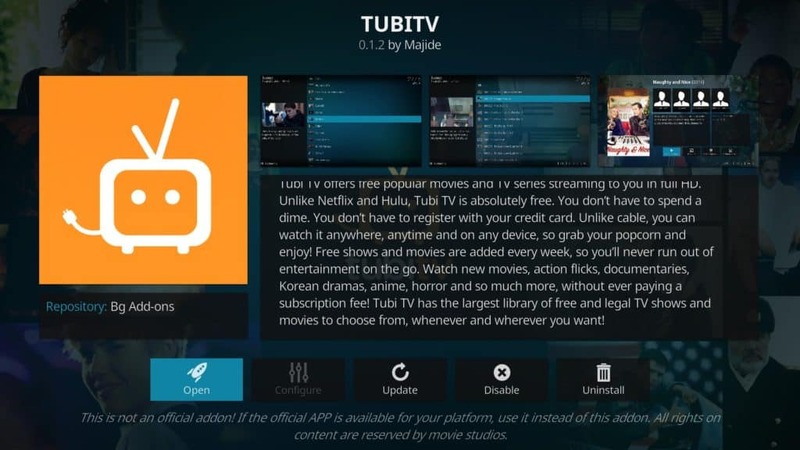 The developers who had worked on TVAddons created a new repo that purges any addon found to provide links to unlicensed streams. As a result, there is no longer any official url that can be used to find a copy of Movies4k.to. There are probably some copies of Movies4k.to still floating around on the Internet, but there is no way of knowing if these copies contain viruses or other malware. Installing Movies4k.to is not recommended. SALTS was another popular addon that was part of the TVAddons.ag repo. For users that preferred HD streams, it had a setting that could be modified that would automatically stream movies from the highest quality link instead of the one that was first on the list. However, like Movies4k.to, official copies of SALTS no longer exist, and installing it carries high privacy and security risks. We do not recommend installing SALTS Kodi addon. Velocity is yet another Kodi movie addon that carried pirated streams. It was popular with videophiles because it clearly labeled HD streams. However, official copies no longer exist now that TVAddons.ag has been shut down. We do not recommend installing Velocity Kodi addon. The Royal We is yet another movie addon that was part of the TVAddons.ag repo. It was popular with fans of HD video because of its wide variety of high-definition titles. Like most of the addons on this list, official copies of it do not exist and all copies found should be considered a security risk. We do not recommend installing The Royal We Kodi addon. Finding Kodi addons that stream high-definition video can often be difficult. Many unofficial addons have links to low-quality streams from pirated sources, and others that used to have high-quality links have been shut down. But there are some legal addons that stream in HD, including Crackle, Tubi TV, SnagFilms, and PlayOn. We recommend using these to watch HD movies. 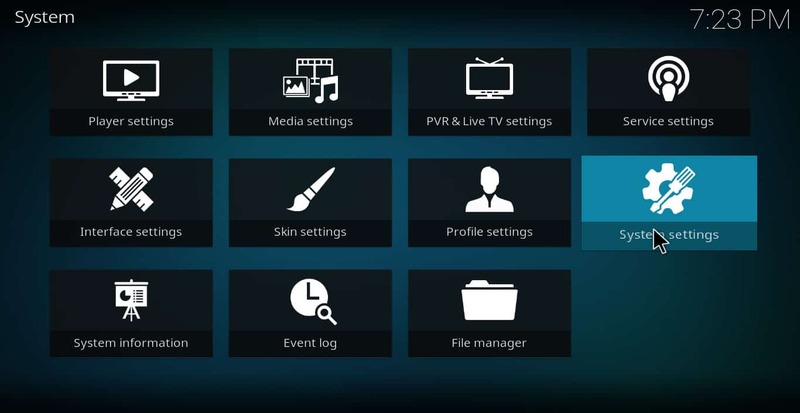 If you’d like to also know how to watch TV shows or sporting events using Kodi, check out our guides to the best live TV Kodi addons or the best sports addons for Kodi.